Recently, LED products in the domestic market enjoys a very high demand. The highest demand at the same time use LED Strip. Despite the abundance of offerings on the market, problem, Related topics, LED ribbon that has ceased to burn, It is relevant for many users. Unfortunately, tough competition is not always the incentive to improve the quality of products. Of course a huge role played by the quality of LEDs, it depends on the type and generation of the element that is used in the film. Therefore, many vendors have traditionally quite successfully increase sales by reducing prices. Buyers, not being skilled in the art LED, acquire on the advice of sellers cheap tape, install them and enjoy the result obtained. True joy this lasts for a brief period of time. Very soon there is a question to users, Why burned LED ribbon. But even in that case,, if the tape to the delight of the customer continues to function, after a while it will lose brightness about 30-40% from initial indicators. And the user will once again be disappointed. In principle, the service life of LED strips long enough. But just in case, when it comes to quality lighting equipment, Made in full compliance with the process. Unfortunately, order 99% LED products made in China. of course, and in China producing high-quality LED strips, but finding them for 100 with little rubles is unlikely to succeed. 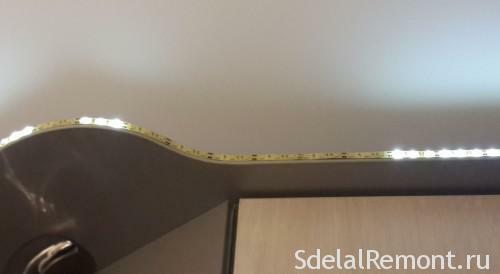 Many consumers of LED products do not reflect on, whether burn LED strip with such a low market value. As a result, they become the owners of the product with a minimum copper content, or even on a foil, low-quality diodes and resistors and decidual adhesive layer, which was made by hard-working people of China in some basement shop. Recommendation: better to buy LED strip with one diode within the whole, instead of consisting of many small elements. In this case, all claims against the seller will be useless. At best, he will visit the Chinese quality, and at worst simply refuse to talk. However, purchase rather expensive tape - it is not always a guarantee of a long work. Breakage can happen to an expensive and potentially quality products. And the problem is often not to use cheap parts and workmanship. the problem is often due to the fact, that the chosen buyer tape does not correspond to its technical characteristics to the conditions, which will be operated. So often do not take into account the effect of the current tape and an energy source, from which it will work or fail to comply with the thermal regime, mounting the LED Strip, intended for use indoors, on the street. Often the reason, that burned part of LED strip or equipment is completely out of order, It is due to an error in assembly. Often users elementary incorrectly set LED Strip. In particular, it does not provide a reliable mechanical protection. As a result, even the most insignificant damage leads to the ingress of moisture or water into the device, and then the individual sections or whole LED strip burn. Sometimes the cause of the entrance of the building belt LED equipment becomes an error, admitted in the preparation of wiring diagrams. Since the bulk of LED strips are chain, consisting of parallel segments, at the ends of all current Chains, passing all sections taken separately, summed up. And in that case,, if it is a large enough segment, total current can be rather big. This usually leads to, track tape that undergo overheating, and so quickly partially or completely fail. To prevent this problem it is necessary to carry out a breakdown of long sections of tape into smaller segments. 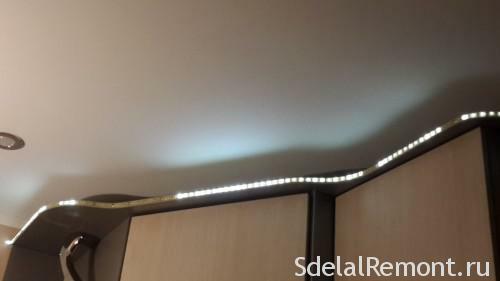 In no event should not be connected in series LED strip, longer than five meters. In this case, only the segments may be connected in parallel. Otherwise, do not avoid significant voltage swings and increasing the current in the tracks. And this in turn will cause the belt causing serious damage, until its exit from the system. Do not operate the tape LED equipment under, when the ambient temperature exceeds + 40 ° C.
It is necessary to prevent the ingress of moisture to exposed tape. Under no circumstances should not be immersed in water, LED Strip, even partially. Equally important to mount the LED ribbon correctly. Correct installation in conjunction with proper operation will allow to significantly increase the service life of LED strips. Before proceeding to the installation of equipment, it is strongly recommended to turn it on and make check of the specified color. Unfortunately, experience shows, that the tapes of the various parties may differ significantly enough for shade. When connecting a particular attention should be paid to the correct polarity. This is especially important, If you do not want, to LED ribbon light stopped after a couple of months. 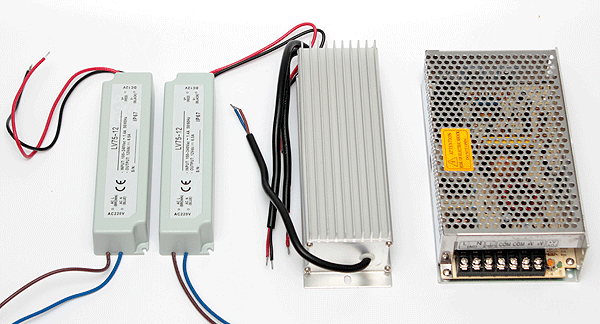 If the LED equipment mounted on a metal or other conductive surfaces, it is necessary to isolate. If you do not, a short circuit occurs, which can lead to the most tragic consequences. In any case the installation can not tolerate even the slightest damage to the track tape. Cut the tape is allowed only between special sections for soldering. If you cut the equipment elsewhere, will be outside the segments. LED Strip frequently burn, because users connect them directly to the household AC power supply, which is absolutely unacceptable. The strip is designed to work only on DC 12 current or 24 volt. Typically, voltage is indicated on the whole length of the tape. To convert the voltage required pulse power unit. This unit is responsible for converting the AC voltage 220 at. a constant current required value. Correctly calculate the current help online calculator. Respectively, when selecting a power supply is very important not only, a DC voltage outputs, but also how much he can give to the load. Not to be mistaken with the choice, careful calculations necessary to produce the total amount of current, which consume mounted LED Strip. And depending on the result to select the power supply. Светодиодные ленты в последние годы очень часто используются для украшения как интерьера, and exterior of buildings. And every consumer, make a choice in favor of this equipment, interested in, that it has served, without causing problems, as long as possible. It is quite possible, important to purchase products only reliable manufacturer and not to make mistakes during installation and operation of equipment. Video: 20 rubles, and your LEDs will no longer be lit.!! !Stabilizer 12V for the LEDs with their hands. Video: How to solder the LED tape ?